We all love to take pictures with our phones, and create memories. However, these pictures we capture with our phones don’t always come out perfect, because they have some unwanted elements in the background. Being able to edit, remove backgrounds, or tweak your pictures helps you to maximize your creativity, and design your own perfect pictures. Here, we are presenting to you, the Top 4 photo Erase apps for iPhone. BackGround Eraser in an amazing iPhone photo eraser app provides sophisticated features and tools to remove backgrounds from pictures. It carries out its work with such a great deal of precision, all you have to do is touch where you want to remove, apply some tools, and your picture will come out in an amazingly beautiful way. Target Area/Target Color function to remove areas that have similar colors automatically. Cut-Out Tools for cutting image. Zoom in while working for accurate pixel-level. Crop pictures quickly with 15different presets features. Add Background photo- remove/change the background of the image. Select Full resolution for the eventual outcome. PNG (transparent) and JPEG (white) background selections. Share directly to your social media apps. Snapseed is a photo eraser app from Google which comes with a variety of amazing tools that help you create professional-looking pictures. It offers more than 25 filters and tools that help you edit pictures that come out sharp and crisp. 29 Filters and tools- HDR scape, Glamour Glow, Healing, Vignette, Brush, Rotate, Crop, Curves, Expand, Vintage, Frames, Tonal Contrast, Lens Blur, Double Exposure, and lots more. An AutoCorrect feature that automatically adjusts picture contrast, colors, and exposure, making them come out sharper and more attractive. 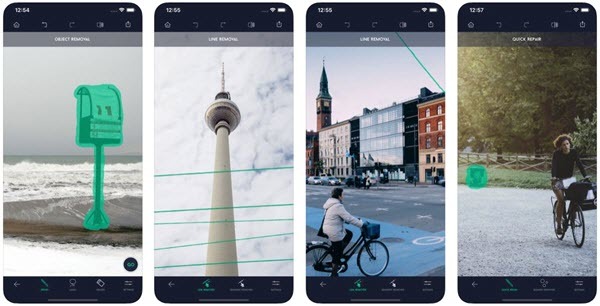 ‘Insights’ feature that gives you tricks and tips for Snapseed and general photography. Smart Cut-out: Cut out figures by drawing a closed curve. Manual Cut-out: Just select the appropriate size of the brush and correctors. App & Photo Albums to save images into. More than 20 awesome filters. Easy to use features: Rotate, rotate, zoom, move. Share your finished images with your friends on social media platforms. More than 50 beautiful background images. 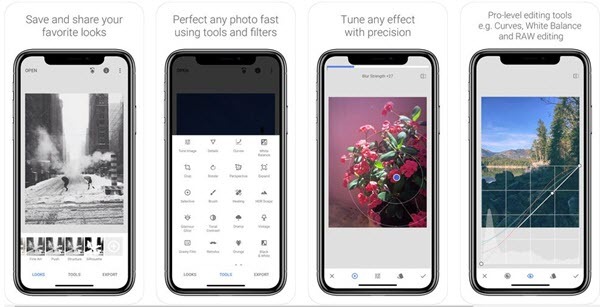 TouchRetouch is a terrific photo eraser app for iPhone that gives you all the tools needed to effectively remove unwanted objects from your pictures. Whatever the ‘noise’ may be that you want removed from your photo- photo bombers, shadows, skin blemishes and pimples, Trash, street signs, telephone wires, power lines- name it, there is no easier way to get unwanted objects out of your images than TouchRetouch. Easy-to-follow Tutorials: In-app videos that provide guidelines on app usage, and tips on how to maximize the app. One-Touch fixes: Eliminate unwanted objects by just marking then. Blemish remover removes minor blemish forever with just one touch. Easy-to-Use retouching: Remove noise from pictures using Object removal tool (choose either Brush or Lasso). Clone Stamp tool for removing defects and duplicated objects. Eraser tool: Use to wipe out cloned objects. You can set eraser hardness, size, and opacity as you deem fit. Securing your personal data and private information is of utmost importance. 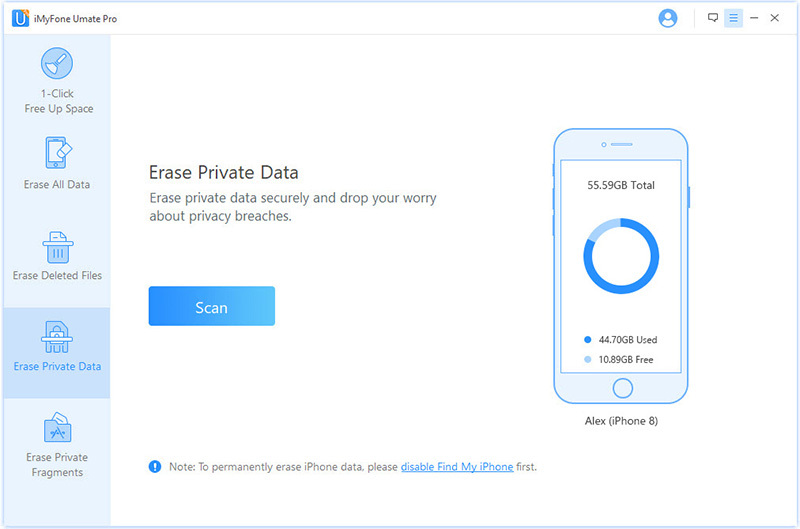 So when you have to change your phone, or sell it, or give it out, it is important to permanently erase your data off the phone to safeguard your privacy. 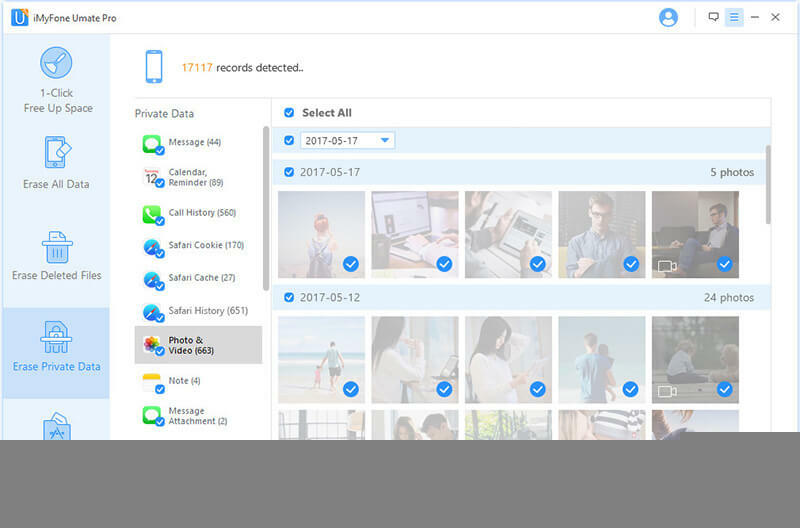 iMyFone Umate Pro comes in amazing features that helps you delete multiple or all your photos from your devices in one click. Permanently erase your private photos/videos to avoid privacy leak. Scan and find previously deleted photos, and erase them permanently, without any chance of recovery. Export photos from your iPhone to your PC and delete them all from your phone in just one click. Compress your photos to save up to 75% memory space, without damaging picture quality. Step 1. Download and launch iMyFone Umate Pro on your computer, and connect your iPhone to it. Step 2. 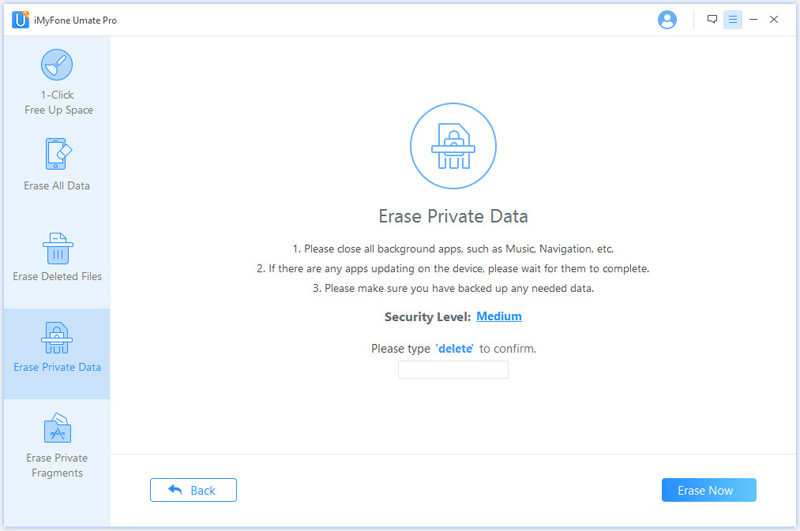 Select the Erase Private Data mode to delete photos permanently. Click the Scan button. Step 3. Preview and select Photos, and then, click the Erase Now button. Step 4. Confirm your action by typing “delete” into the box. Your photos are permanently deleted. Permanently erases all kinds of files- including videos, messages, notes, safari data, audiobooks, and more. Permanently erase fragments left over by third-party apps, to avoid privacy leakage. Free up space on your device with the 1-click free up space feature.